Posted on January 12, 2017 by Kate H.
This is Kate, returning for another Grave Thursday installment. For this post, I decided to incorporate my work with Dave’s to bring you the full story of the watchman on the bridge, Silas T. Cobb. 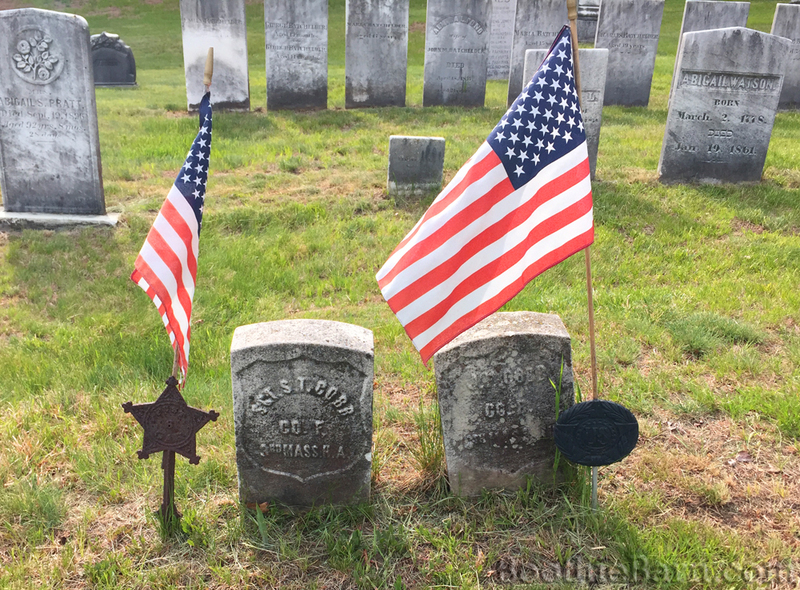 Sergeant Silas Tower Cobb is most remembered to history as the man who unknowingly created the John Wilkes Booth Escape Route. 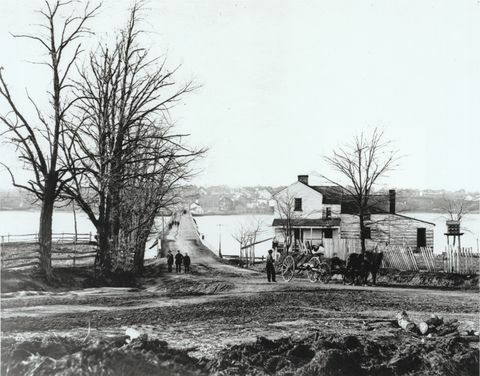 On April 14, 1865, Cobb allowed John Wilkes Booth and David Herold to cross the Navy Yard Bridge out of Washington City and into Southern Maryland. Riders were not allowed to cross the bridge after 9 PM but Booth and Herold arrived at almost 11. Unaware that President Abraham Lincoln and Secretary of State William Seward were mortally and severely wounded, Cobb allowed Booth and Herold passage. Rules had been lax since the surrender of General Robert E. Lee and riders wishing to leave the Capitol City did not seem nearly as dangerous as riders seeking entrance. Cobb drowned two years later at the age of 29 during a boating accident in Grand Haven, Michigan. You can read more about Cobb’s later life here. This is the story of his life leading up to April of 1865. Named after his father, Silas Cobb was born on October 13, 1838 in Holliston, Massachusetts to Silas and Sophia Cobb. He spent his childhood training as a boot maker, a trade which he would resume after the Civil War, and sailed to the Arctic when he was 19 as a crewman aboard a whaling ship. Cobb did not immediately enlist in the Union Army following the firing on Fort Sumter. Instead, he married Sophia Treen. The couple had one child together, a daughter named Ada, but she died in infancy about a month after the execution of the conspirators. In 1863, Cobb enlisted in the Union Army, joining the 3rd Massachusetts Heavy Artillery. The regiment remained in its home state until it was called to Washington City to guard its various bridges and passageways. In 1862, General Lee had attempted a march on Maryland to put pressure on Washington and by 1863 had invaded Pennsylvania. Perhaps one reason the 3rd Massachusetts was sent south was to barricade the Capitol in the event that Lee managed to break significant Union lines. Lee’s campaign ultimately failed but it placed Cobb on the Navy Yard Bridge, keeping him from being lost to the pages of history as another name on another roster. While Lee never appeared, on April 14th Cobb received a different kind of Southern sympathizer on the bridge. The rest is history. It is not known for certain why Cobb was in Grand Haven when he died. Some historians theorize that he was attempting to sell boots, having been honorably discharged from the Union Army and resumed his shoe making. 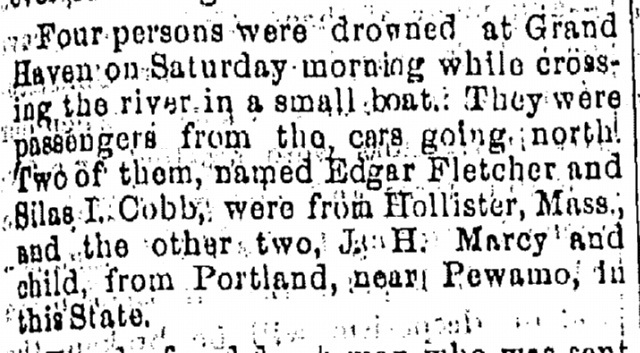 Evidence for this theory points to a friend Cobb knew from his time in Holliston, Edgar Fletcher, who was also a boot maker. The pair were traveling through Michigan together. Both perished in the accident. 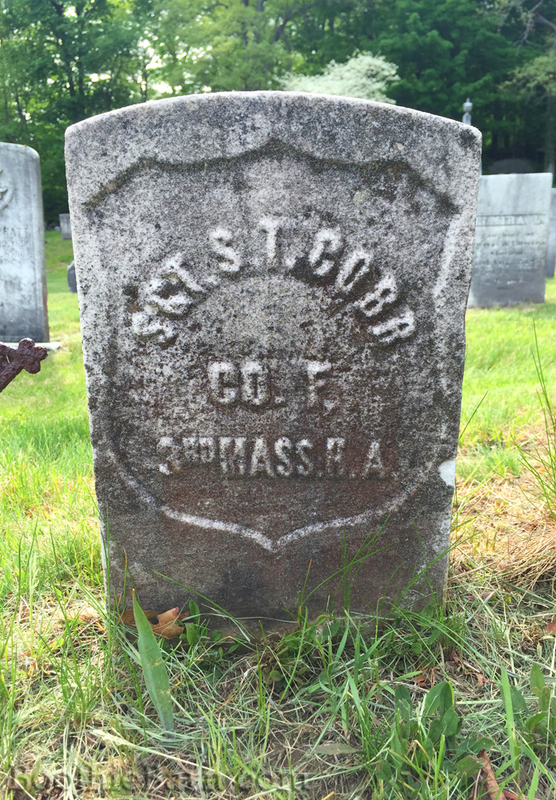 The body of Silas T. Cobb was brought back home to Holliston where it was laid to rest in the Central Burying Ground. A small military headstone marks the site today. Much like Cobb, it is a stop on the road to more recognized places (Fall River to the South, Boston and Salem to the North) but it is still a stop worth discussing due to its brush with history. Question. What was the protocol for Booth and Herold in crossing the bridge? Could they ride across or did they have to dismount and walk? I believe this to be a very good question and worthy of discussion. The record of what transpired at the Navy Yard Bridge comes from the official statement and the conspiracy trial testimony of Sgt. Silas Cobb. In his statement to authorities specifically, Cobb gives wonderful details about the two riders who crossed his lines. For example, we learn that Booth was wearing a “soft black or dark brown felt hat” and that “his hands were very white, and he had no gloves on”. Cobb even provided details about Booth’s voice stating it was, “rather light, and high-keyed”. For Davy Herold, Cobb described him as wearing, “a light coat, light pants, and a snuff colored felt hat, of rather a light shade.” He even let us know that Davy was, “the heavier of the two”. When it comes to the actual method of crossing the bridge, Cobb does not give specific detail. This is probably due to the fact that crossing people over the bridge was so commonplace to Cobb, that he didn’t consider the way in which Booth and Herold did it to be any more notable than any other person. He does provide a few statements that we can piece together though, to paint a seemingly accurate picture of what the process was. Q. Did you have a good view of his face? Was there a light? A. I did. I brought him up before the guard-house door, so that the light shone full in his face and on his horse. A. He is very near the size, but I should think taller, although I could not tell it on the horse; and he had a lighter complexion than that man. The darken part is very important. Cobb, the man who provided so many details about the men who he crossed over the bridge, was unsure about Davy’s height. It appears his explanation for this is because the Davy stayed on his horse and so Cobb was not able to accurately compare Herold on his horse with Herold on the prisoner dock. This testimony appears to favor Booth and Herold remaining on their horses. During my first few readings of this, I pictured Booth walking his horse as a man would walk a dog. In my eyes it appeared as if Booth (who apparently showed no physical pain supporting Michael Kauffman’s theory that he broke his leg later in a horse fall) kept his horse close to him and acted like a child crossing the street by walking his bicycle. Upon further reading and trying to put myself into the correct 19th century equestrian mindset though, I read this now as Booth riding his horse at a walking pace across the bridge. The last phrase, “I do not know with what speed he rode after that,” implies to me that Booth was already riding his horse and not walking it on foot. I want to believe the detail oriented Cobb would have stated something along the lines of “he remounted his horse” if Booth was actually walking alongside it beforehand. There is no specific statement by Cobb saying that Booth and Herold ever dismounted their horses. In addition, the few details that Cobb does give regarding the process appears to imply that they remained in their mounts during their entire time they conversed with him. There is no smoking gun or definite answer to Richard’s question, but I believe the majority of the evidence points to Booth and Herold staying on their horses when they crossed the Navy Yard Bridge. 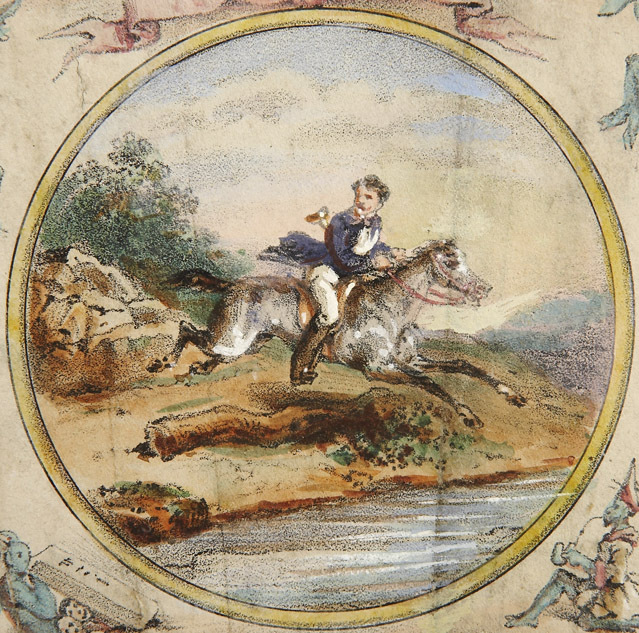 Booth making his escape on horseback. On April 14th, 1865, Sgt. Silas Tower Cobb was in charge of the Army’s guard detail over the Navy Yard bridge leading out of D.C.
During that night, he was approached by three individual riders all looking to be crossed over the bridge. As a proper guard he interrogated the men asking them where they were going, why they waited until after 9:00 pm to depart, and what their names were. The first man replied he was going to his home in Charles County, MD, “close to Beantown”. He pleaded ignorant of the rule forbidding passage over the bridge after 9:00 and stated that, “It is a dark road, and I thought if I waited a spell I would have the moon”. Sgt Cobb was hesitant to let him pass but the man who gave his name as Booth seemed proper enough and his answers had been satisfactory. While Cobb’s standing orders had been that no person was allowed to cross the bridge between 9:00 pm and sunrise, the enforcement of these orders had been more lax as the war had dwindled down. Sgt. Cobb unwittingly allowed the assassin of Lincoln to cross his line. Not long after this, another man rode up giving his name as Smith. He told Cobb he was heading home to White Plains. Again, Silas Cobb informed the man that passage over the bridge after 9:00 o’clock was forbidden. Smith replied, “I stopped to see a woman on Capitol Hill, and couldn’t get off before.” Though this man did not appear as proper as the first man, he allowed him to cross the bridge as well. Sgt. Cobb had unwittingly allowed David Herold, one of the Booth’s accomplices, to cross his line. History repeated itself as a third horseman appeared. This man asked Cobb if he had passed a man on a horse fitting the description of “Smith”. Cobb replied in the affirmative. The third man told Cobb he was a stableman, and that “Smith” had run off with one of his horses. The stableman, John Fletcher, asked for permission to cross and give chase. Cobb told him that while he would be allowed to cross out of the city, he would not be permitted to return until daybreak. Fletcher decided the idea of spending all night stranded outside of the city looking for a lost horse was an unappealing one and returned to the city to report his loss to the police. It is one of those odd twists of fate that the man who permitted the river crossings of two Lincoln assassination conspirators would meet his end in his own unfortunate attempt.